There are few things more important while traveling than having enough fuel. Mileage between fuel stops varies in different parts of North America, but in the rural West, long distances between filling stations are displayed on road signs to alert drivers. I’m merely referring to our paved scenic byways, if we include the long-distance travel needed to reach some backcountry routes, then the total capacity needed to complete a loop, or just return to the nearest station, adding fuel capacity and range is hard to argue against. 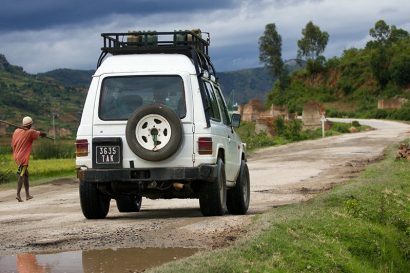 On extended and remote overland trips, range should be calculated to avoid running dangerously low, or out. Our distance-to-empty expands our travel experience possibilities. To provide more range everywhere, and a backcountry safety net, many resort to using portable jerry cans. This has been the method I’ve used most recently, but there are drawbacks: fuel is both heavy and inherently dangerous. Properly securing enough 5-gallon (20-liter) containers can be a challenge. Bill Gaines was an engineer for General Motors for 10 years living with his family in Michigan, but he wanted to get back to his western base. Returning to Northern California, Bill started working for Travel Accessories, and later he took over their small-fuel tank division. In 1983, he founded Transfer Flow Inc. (TFI), starting small with only five employees. Transfer Flow has grown and currently employs 85. 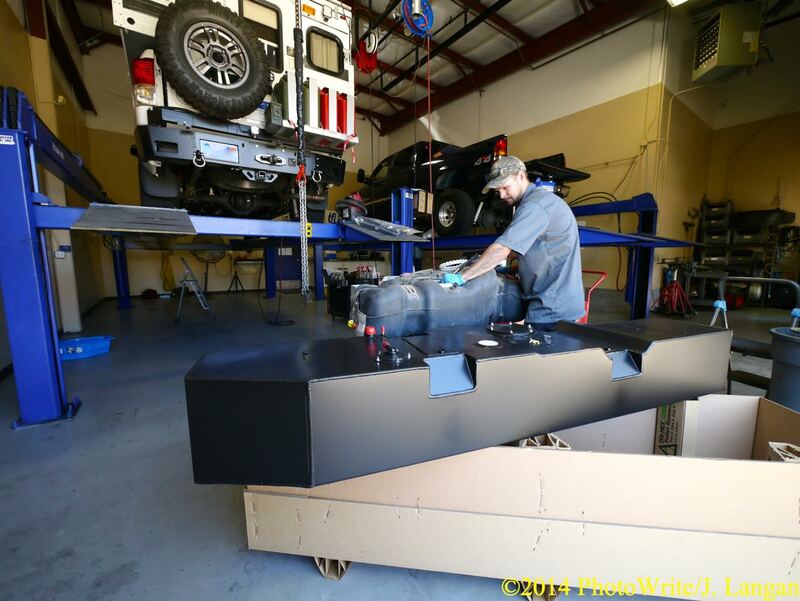 Initially making only motorhome tanks, in 1987 TFI started producing aftermarket in-bed and replacement fuel tanks for pickups. Transfer Flow remains family-owned, having passed-down from father to daughter, with an average employee tenure of 15 years. Everyone I met at TFI seemed genuinely happy to be working there. Most of Transfer Flow’s engineers were educated at Chico State University, and their certified welders were trained by local Butte College. Transfer Flow has been approached many times about making their products less expensively in Mexico or China, but they have no interest. Transfer Flow is committed to doing business in Chico, California, and they focus on networking with other Northern California manufacturing companies. 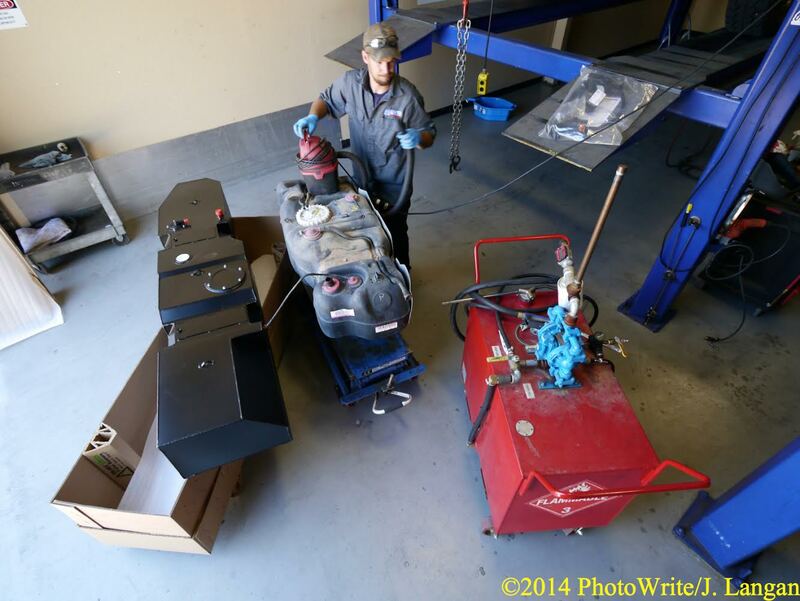 After the 2008 recession they added brake and fuel-line manufacturing to their core fuel and hydraulic tank business. 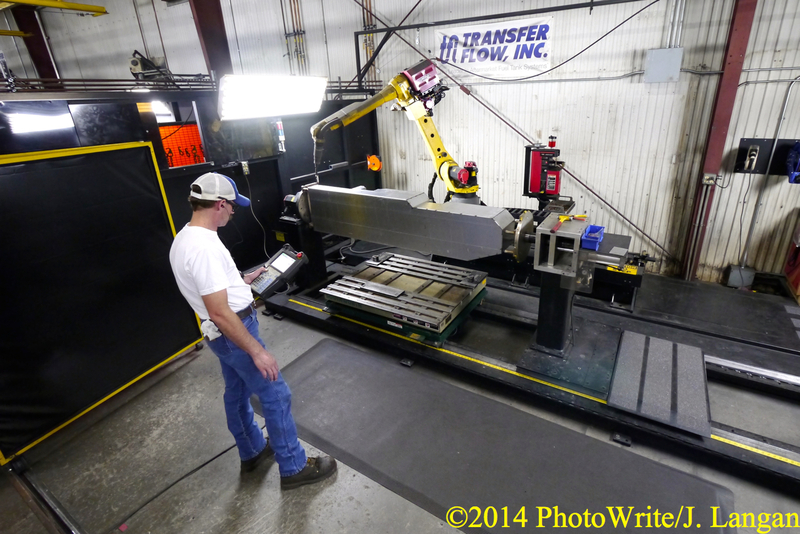 Transfer Flow is a strong company, and just prior to my visit had their biggest sales month ever, in May 2014. Adding a suspension lift, skid plates, rock sliders, and front- and rear-winch bumpers from Bud Built, plus recovery gear, tools, and a Four Wheel Camper had the expected impact on gas mileage. The 26.4-gallon (100 liters) factory fuel cell just didn’t take us very far. 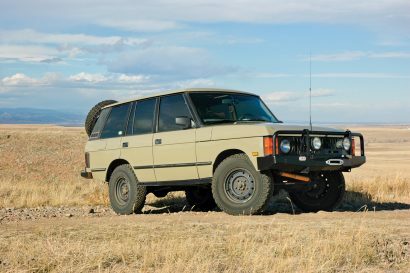 My first effort to increase range was to add four AT Overland can holders to the rear swing-away. However, dumping fuel cans is inconvenient, and they are generally reserved for off-pavement use. If not needed for fuel the AT carriers can haul water, or the swing-away and its load can be removed to eliminate the substantial weight far behind the rear axle. 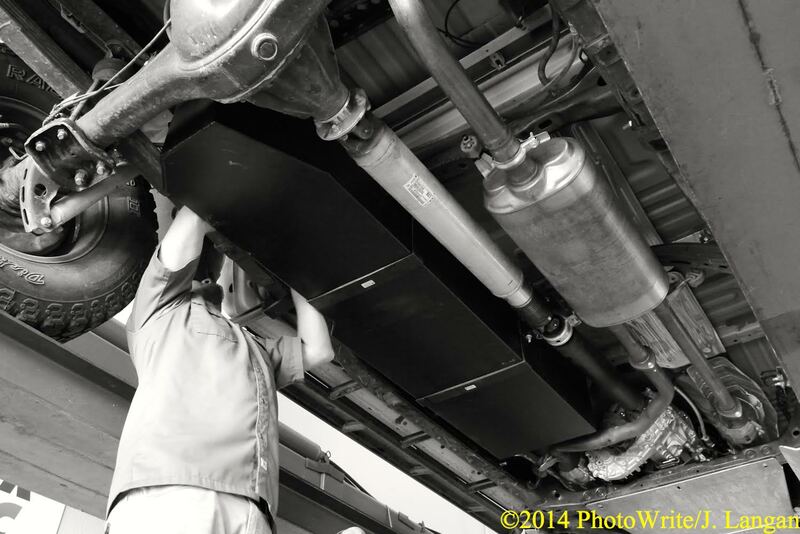 The TFI 46-gallon replacement cell is a better fueling solution. 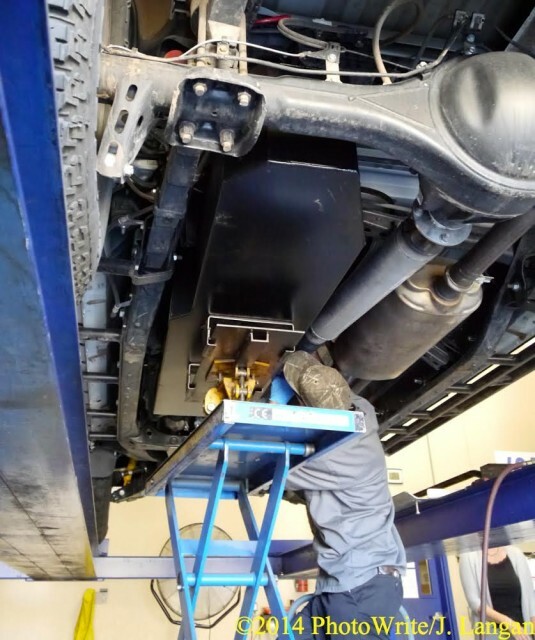 The midship replacement tank for the 2007–2015 Tundras consumes much of the unused space between the frame rails on the driver’s side of the chassis, starting just behind the transfer case and exhaust crossover pipe, extending rearward and terminating just in front of the rear axle. The new container is also taller, shaped to fill voids below the body. 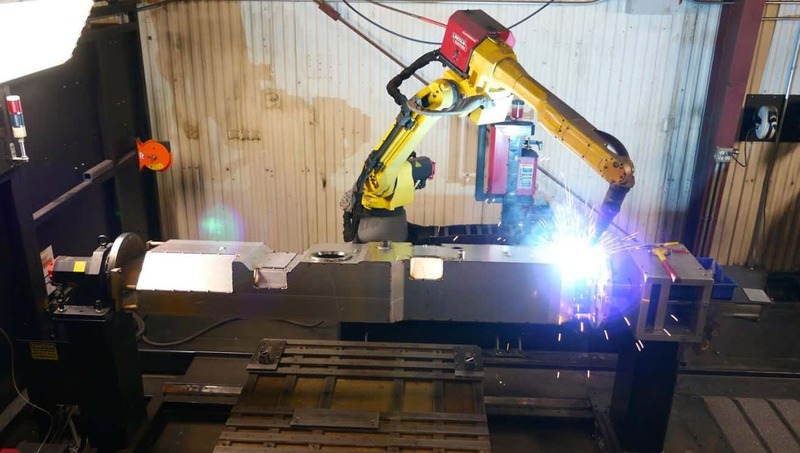 Replacement tanks are constructed with 14- and 12-gauge steel that is electroplated with aluminum by the steel manufacturer, adding corrosion resistance. This is the same material TFI has used for over 31 years. Removing an estimated 30 pounds of shipping material from the 180-pound ship weight (pallet, cardboard), the new tank is 121-pounds heavier than the 29-pound factory poly cell we removed. When full, the 20 additional gallons of gas adds 120 pounds. All this weight is low and between the frame rails, a much better place to carry the load than on the rear bumper. 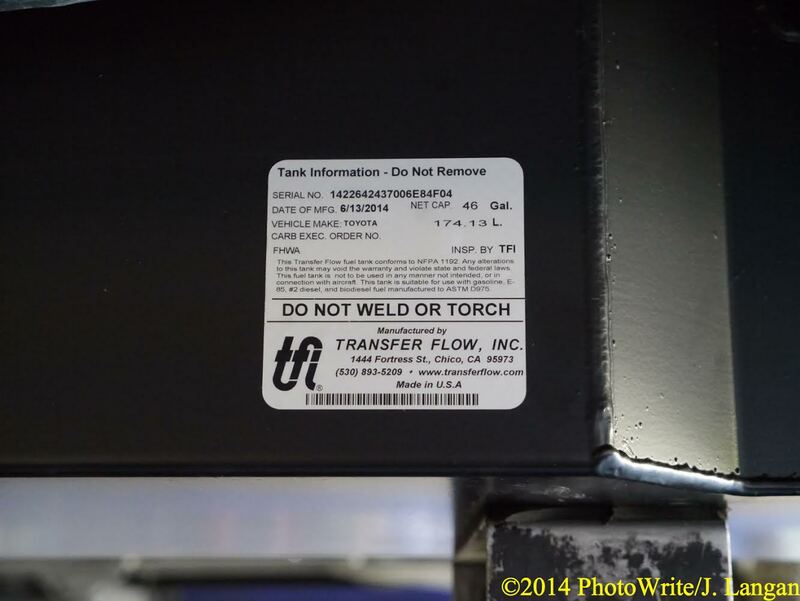 The second-generation Tundra cell is Transfer Flow’s best selling replacement tank, but it is not available for vehicles registered in California. 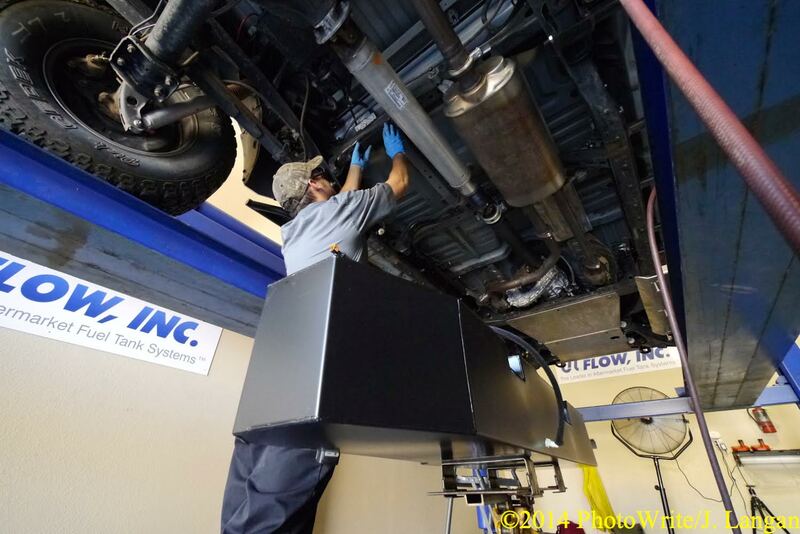 Transfer Flow has spent considerable time and money to meet the Golden State’s difficult emission standard. They are close; getting this product approved for California trucks is a goal. 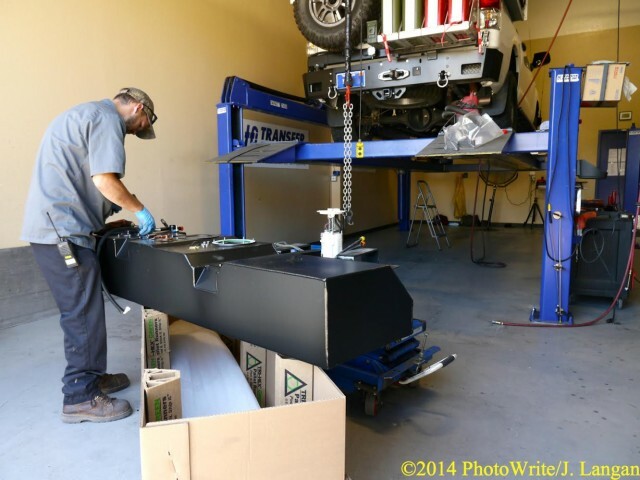 Most aftermarket parts are designed to fit stock, unmodified vehicles. I’m found of saying, “modifications lead to modifications”. Once rolling down the customization trail with a heavily modified vehicle like this Tundra, care must be taken to insure parts are compatible, and challenges are expected. This pickup was armored with a complete set of Bud Built stainless-steel skid plates, including a gas tank skid that had to be removed. The truck also has Bud Built’s Beefy rock slider/steps, which were not in the way. What was unclear until the project was about to begin at Transfer Flow’s facility in Chico, California, was that the Bud Built transfer case skid would hinder the process, because it extends too far aft. The transfer case skid was removed, cleaned, wrapped, and placed in the back for transport home, where I later shortened the plate and drilled new holes before remounting. Further along, another snag presented itself. 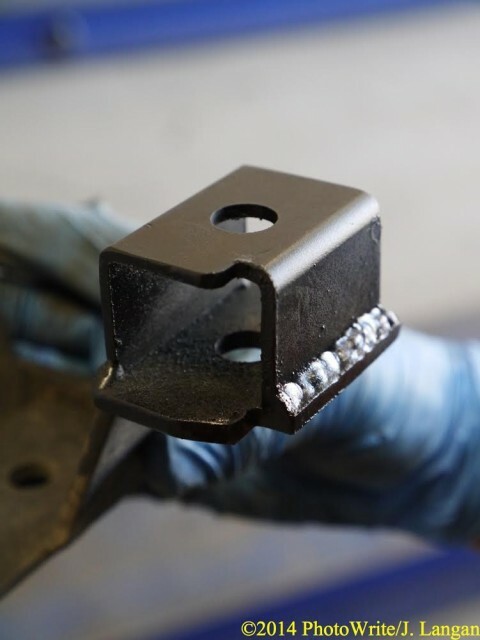 The Streetacos rear driveshaft carrier bearing drop bracket prevented one of the forward TFI straps from being tightened. The installer immediately advised his supervisor, and one of Transfer Flow’s on-site engineers arrived to assess and help correct the problem. 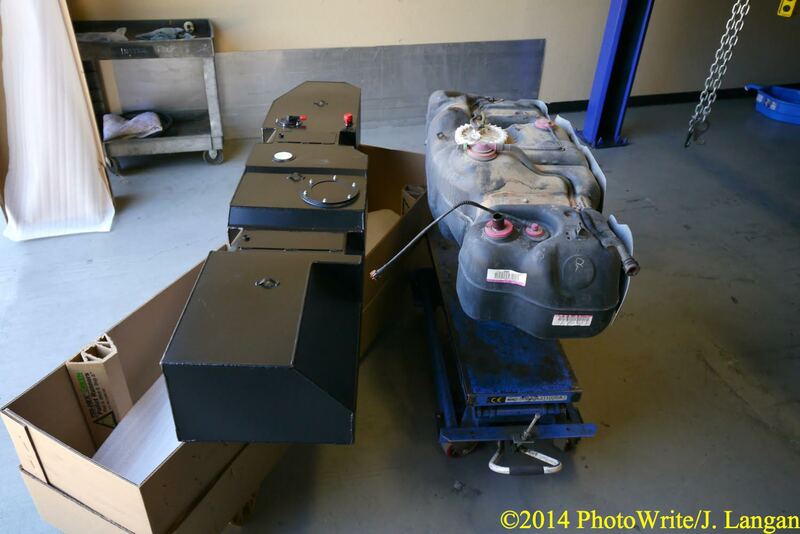 A modification to the Streetacos bracket allowed the tank strap to seat, and the installation moved forward. Transfer Flow was clearly focused on doing quality work. They were not going to sacrifice their procedures or standards because of a previous modification I’d made; I appreciate this attitude. 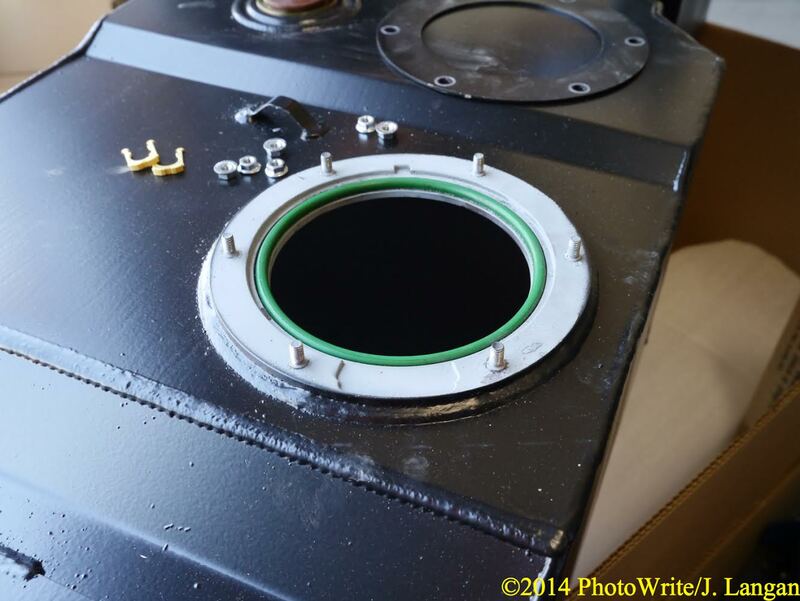 The installer also cleaned and wiped fingerprints off the new tank at the end of the job. Attention to detail, customer service, and satisfaction are clearly priorities. Transfer Flow has my complete confidence when it comes to working on my vehicles, which is saying a lot, as I prefer to do my own work. Another noteworthy detail was their handling of the fuel. After the stock tank was removed the remaining gas was measured as it was pumped out, then measured again when it was pumped into the new tank before it was hoisted in place. Once the installation was complete, the tank was filled at Transfer Flow’s on-site fueling station. Customers simply pay what Transfer Flow pays for fuel. They have a very fair and efficient system, which includes appropriate paperwork before any work begins. Transfer Flow notes how far below the frame their replacement tanks extend, but in years past I was cautious about using this information. I was concerned about the additional length of the TFI tanks, and where along the frame they were making their measurements. My focus has always been actual ground clearance under the truck before and after modifications. There was no cause for concern. After removing the stainless steel Bud Built skid plate from the bottom of the presumably vulnerable factory poly cell, a measurement was made from the bottom to my level shop floor. Parked in precisely the same location and making the same measurement with the new 46-gallon tank, the distance was exactly the same, 13 11/16 inches; there was no loss in ground clearance on my chassis. In fact there was a slight increase in overall ground clearance as the 3/16-inch Bud Built skid plate rode below the OE tank. Surely the Bud Built skid is stronger when it comes to extreme off-highway use and rock-crawling, and could have been protective when needed. However, the TFI tank should resist punctures and cuts better than the stock poly cell, the bottom is 12-gauge steel. Transfer Flow has the details dialed. Their paperwork explains how the stock gauge corresponds to the capacity of the new tank, more information than is provided for the factory setup. As discerning drivers know, factory fuel gauges are not always linear, and its often unclear how much fuel remains as the needle swings toward empty. The gauge now reads full from 46–42 gallons, at three-quarters 37 gallons remains, half equals 27 gallons, one-quarter indicates 15 gallons, and when the needle hits empty there is still approximately 7 gallons of gas in the tank; that’s what I call a reserve! 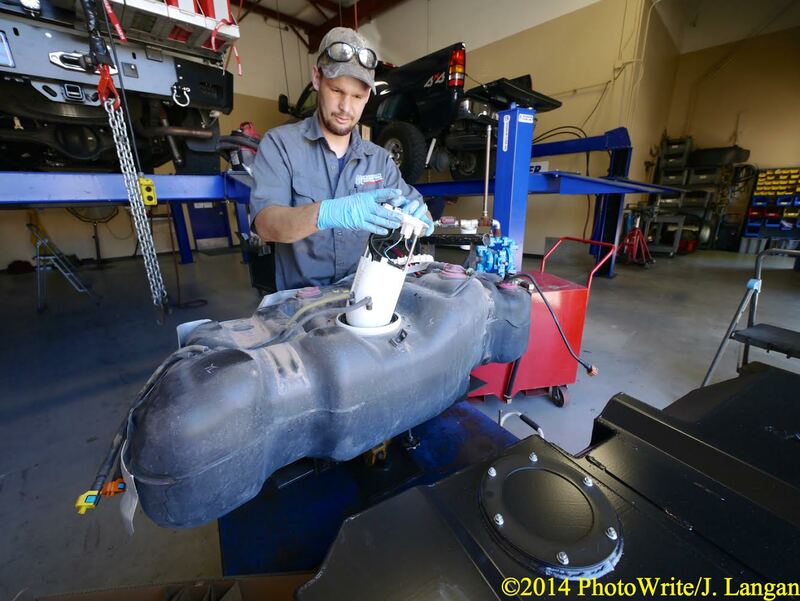 Transfer Flow urges replacing the fuel filter after the first 2–3,000 miles, recommending the standard maintenance intervals thereafter. That’s easy to do on diesel trucks or any rig with an external fuel filter, but it is impractical on many modern gasoline-powered rigs that have fuel pumps and filters inside the tank like this Tundra. I added a bottle of Red Line SI-1 gasoline additive to my second fill-up, and typically I buy fuel at high-volume stations. I’m gambling I won’t have a problem nor need to replace the difficult-to-access filter. Our first long trip in the Tundra after adding the 46-gallon tank was a 2,500-mile vacation from Nevada to Colorado, and back. The security and added driving enjoyment supported by the additional capacity are a big deal to me. Several times during our trip I told my wife how much I loved the extra range. There’s no substitute for being able to travel a few hundred miles in a heavily-loaded truck and still have at least two hundred additional miles on-tap. 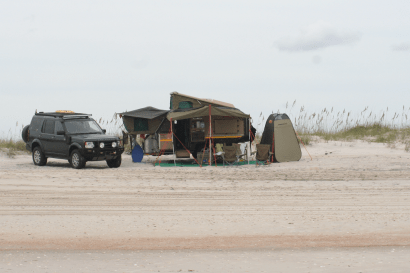 Our total trip average was 12.9 miles-per-gallon with our Four Wheel Camper in the bed, yielding nearly 600 miles per tank. Fuel prices vary by station, state, and region, and it’s easy to pay $0.20 or more per gallon than necessary. With much longer distances possible between fill-ups, the strategic planning of fuel stops while shopping for cheap gas was a pleasure. The GasBuddy iPhone app helped locate inexpensive fuel. When combined with economical driving we often saved several dollars per fill-up. 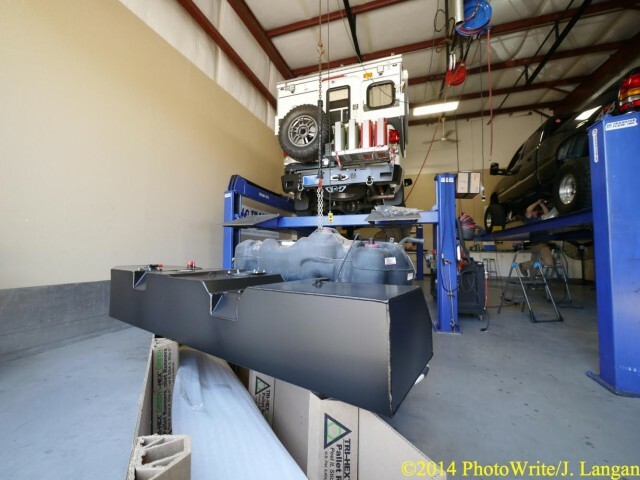 This Overland Journal long-term Tundra project has numerous nifty and functional accessories, yet the addition of this Transfer Flow replacement tank has me questioning if this might be the best or at least the most practical modification yet. I’ve had trucks with big tanks before, mostly diesels, and I love having the added capacity and range on this vehicle; it makes for a much better travel rig. With a love of wheels since his first day of preschool, where he immediately discovered the tricycle, James continues to pursue his passions with trucks and motorcycles. With a keen eye for detail, he is a photographer, a writer, a precision driver, and an expert motorcyclist. i am looking for a larger tank for my tundra. can you help me with this?